The opportunities are endless in the freelancing website revenue generation. Freelancing business is the hot trends in the market today. You can hire desired developers, designers, and creative handler to work on your new projects. We have built and design this freelancer script to start a website in a minute. In the user-friendly website, we have categorized Freelancer Clone Script into three layers collectively employer dashboard, freelancer dashboard, and powerful admin dashboard. 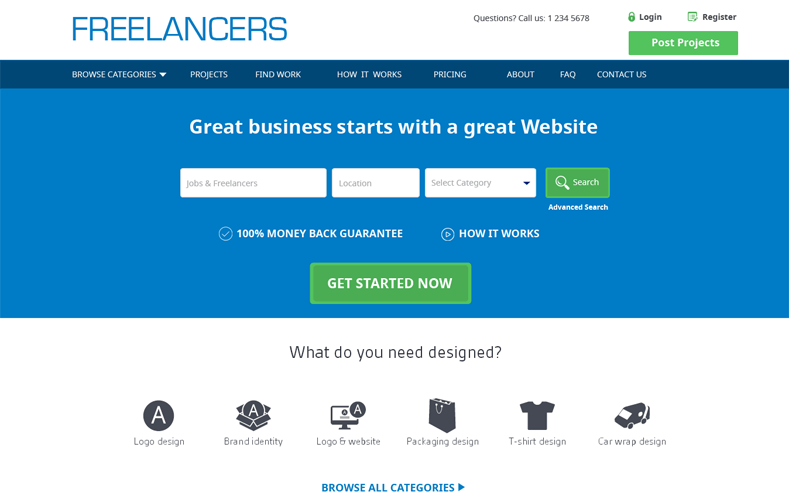 Freelancer website is designed and developed to attain maximum stability and revenue generation motive. Employers have to register into the site with valid credentials and get access to navigate through the site. Under browsing categories, the user can view the project, where the list of the project is viewed with the project name, location, and cost details. Search filter enables searching required results such as selecting the project price type (Fixed price projects, hourly projects), search by skills option, view pricing plan, details about the company, number of project, last month payouts, payouts date etc. In the elance Clone Script user can post project along with certain categories and subcategories and mention the project name, project description, skills required for the project which contains project budget and bid expiry. Salient features include a newsletter, dashboard, leads, quotes (pending, approved), payments, internal messages, profile management etc. On taking account of Freelancer, registered freelancer gets sort of various projects and the complete details of the particular project (Project id, project description, job details, about the employer, ratings, additional files, and skill required). You can easily find work by selecting a category and budget type in nearby locations. A freelancer can filter the invoice by selecting the option (unpaid, paid, withdrawn, rejected, all invoice), also enables communication through employers. In the profile, the user can see the bid status of the project, portfolio, add a review, update skills, and more. Scriptlance Clone Script is most familiar among the people, though the admin panel freelancer and employers are managed easily. Managing the category and subcategory, user management, add new project etc. in the membership view, admin can view the details like membership account, icon, rating, employer fee, freelance fee, project, skills. Bidding list enables a number of bid count and status of that. On the finishedproject, admin can update the status of the project. Through newsletter subscription website owner could send an email notice to the subscribed users. Manage general settings like about us, FAQ, how it works, testimonials, timeline, information, Employers, services, contact us, social network connection. Very Good and Instant support, I recommend to everyone! Really Strong Support, and understand your issue. Good script Also.